While fantasy has gone from strength to strength in recent years, horror has gone the opposite way: the genre stagnated and then began to decline. While the genre's established authors - such as Stephen King and James Herbert - were still writing horror, there was a serious lack of new talent to drive the genre forwards. Yet 2010 might just be the year that the horror genre shows that there's life in it yet. And Adam Nevill might just be the author to do it. Nothing new there, right? Wrong. This is far from a standard haunted apartment ghost story - Apartment 16 is a superbly written tale of dark forces, obsession and delirium, and a horrific secret that has destroyed many lives...and now threatens to destroy even more. Author Adam Nevill has worked as a porter and night watchman in the exclusive old apartment blocks of London, and these experiences have enabled him to invoke a streak of authenticity that resonates through his work. When you've spent hours patrolling such old buildings in the dead of night, listening to their sounds and becoming accustomed to their subtle nuances, it's logical to start thinking of them as some sort of living entity. This is exactly the effect that Nevill manages to achieve in his novel - a living, breathing (or make that wheezing) apartment block, slumbering in its own history, all shadowed staircases and sepia facades. Unsurprisingly, it makes for a great setting for the story. Nevill's characters are as well drawn as his setting: Seth is a convincing down-and-out, whose life is teetering on the brink, and his struggles are harrowing and visceral. Apryl provides a good foil as a happy-go-lucky young woman who finds herself pursuing a mystery that quickly becomes an obsession, and which carries its own grave consequences. The other characters that populate the apartment block are also distinctive and memorable - while Neville was surely at an advantage because he's worked with these sort of people first hand, at the same time it must be said that he posesses an eye for detail and for all the little quirks and personality traits that so often define a person. Subsequently his characters - even those that appear only briefly - possess depth and presence. Nevill's most admirable achievement in terms of characterisation is the character of Felix Hessen - at times I felt like I was reading about a genuine figure from history, such is Nevill's expertise at building up the man's background and revealing snippets about his past that contributed more and more to the dark, dangerous allure that surrounded him. Equally satisfying are Nevill's plotting and prose. The story is carefully constructed and rips along for the most party at a gratifying pace, with a good twist thrown in for good measure. Hints are dropped here and there regarding certain characters' involvement in various events, and I enjoyed entertaining these questions and theories in my breaks between reading. As for the prose, well...as regular readers know, I'm a total sucker for a decent bit of stylish, noir-ish, evocative prose. And I was extremely pleased - and surprised, I'll admit - to see that Nevill really delivered on this aspect. His prose is very good, often superb - the images he paints are bleak at times, horrific at others, and his wordplay invokes an excellent sense of brooding atmosphere. The acid test to determine truly excellent prose - for me at least - is to see if I ever stop to re-read a sentence or paragraph, to fully appreciate the language used. I did this several times during reading Apartment 16, so that says it all. At times I was reminded of another excellent horror writer, Conrad Williams, whose book One was (in one of those odd coincidences) edited by Nevill in his former capacity as an editor at Virgin books. Drawbacks? None really spring to mind. Now and again the pace of the plot faltered slightly, and one or two scenes perhaps could have been shortened since their relevance and overall importance seemed fairly minimal. But this is a very minor point. Verdict: A wonderfully written, deftly-plotted tale of terror. 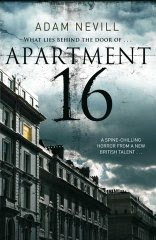 Apartment 16 kept me guessing right to the end, and kept me turning pages long into the night. If horror is going to make a comeback in 2010, this is the book to lead the charge. Highly recommended.